New Witness Testifies At Hearing For Adnan Syed Of 'Serial' Fame : The Two-Way At Wednesday's hearing, lawyers for the convicted murderer presented an alibi witness, Asia McClain, and attacked inconsistencies in the state's case in the hopes the judge will order a new trial. 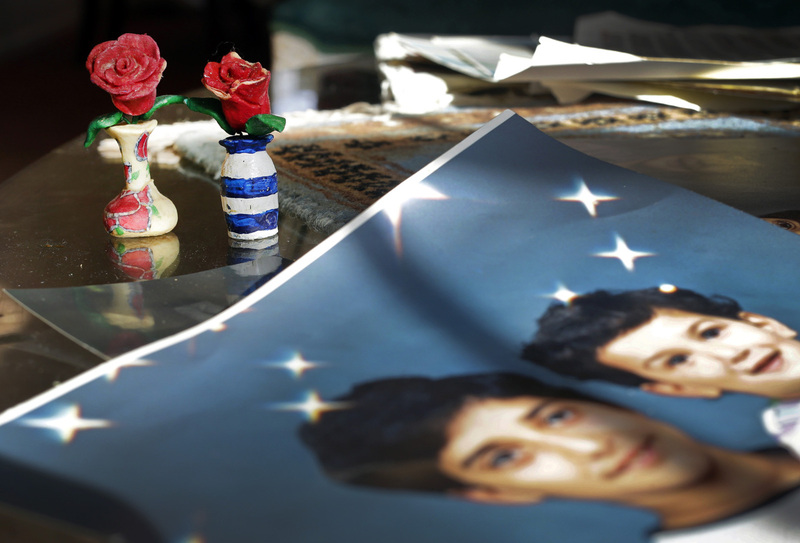 On Dec. 10, 2014, prison artwork created by Adnan Syed sits near family photos in the Baltimore home of his mother, Shamim Syed. Syed, convicted in 2000 of murdering his girlfriend, is appearing at a hearing Wednesday to request a new trial, based on evidence uncovered by the podcast Serial. Today McClain was in court, giving testimony that could convince a judge to order a new trial for Syed. Andrea Seabrook was in the courtroom, reporting for NPR. "Today the judge heard testimony from Asia McClain. Serial listeners will probably remember that name," Seabrook said on All Things Considered. "She is the one who says she saw Adnan Syed in the library at the exact same time that the state said he was out committing a murder." Seabrook reports that McClain brought notes and cell phone data that contradict what prosecutors have said in past proceedings. "What's fascinating about her is she didn't even know how important she was to the case until she heard about it on Serial," Seabrook says. The judge will hear testimony Thursday and Friday, but it is unclear when he will make a decision. If you're just catching up, each season of Serial follows a single true story, told episode by episode. The first season investigated the case of Adnan Syed, who was convicted of murdering his ex-girlfriend more than 15 years ago. Host Sarah Koenig and her team uncovered inconsistencies in his case — including the fact that Asia McClain was an alibi witness. She said she'd seen Syed at the time Hae Min Lee's murder occurred, but that testimony was never brought forth in court. The podcast became the most-downloaded of all time, fascinating more than a million listeners and inspiring passionate communities of amateur sleuths and Adnan obsessives. Now Syed is back in court — at a hearing that offers a chance at a second trial. As Seabrook reported on Morning Edition, it's a surprising development for a case like this. "Syed was convicted. He's been in prison for more than 15 years — he's 35 now," she says. "It's remarkable that he is getting a hearing now." He was convicted in 2000 of the murder of Hae Min Lee in 1999. Syed's new defense attorney, C. Justin Brown, says he'll be presenting witnesses and exhibits, Seabrook reports. "We're confident that after we have entered all the evidence that the judge is going to carefully consider it and it's going to win Adnan Syed a new trial," Brown says. As Seabrook notes, there's no guarantee of redemption here. Even Koenig, after researching Syed's case for a year, wasn't entirely convinced he was innocent. But she did conclude, as she said on All Things Considered, that "something went wrong with this case." It's not the first time Syed has requested a new trial. The Baltimore Sun reports that his most recent attempt, in 2012, was denied "in a sparsely attended hearing." A previous version of this story misspelled Asia McClain's name as McLean.